Reading for today: Chris Hedges, “We All Must Become Zapatistas” (TruthDig). Subcomandante Marcos, the spokesman for the Zapatistas (Ejército Zapatista de Liberación Nacional, or EZLN), has announced that his rebel persona no longer exists. He had gone from being a “spokesman to a distraction,” he said last week. His persona, he said, fed an easy and cheap media narrative. It turned a social revolution into a cartoon for the mass media. It allowed the commercial press and the outside world to ignore traditional community leaders and indigenous commanders and wrap a movement around a fictitious personality. His persona, he said, trivialized a movement. And so this persona is no more. The future of Zapatismo never should have been dependent on one pop culture icon. han good to the movement. Early Jan. 1, 1994, armed rebels took over five major towns in Chiapas. It was the day the North American Free Trade Agreement (NAFTA) came into effect. 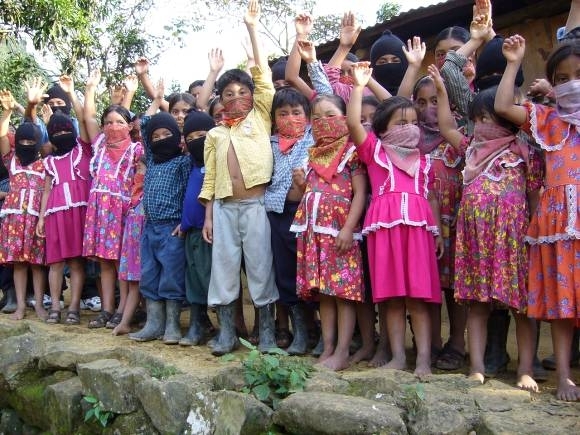 The EZLN announced that it no longer recognized the legitimacy of the Mexican government. It denounced NAFTA as a new vehicle to widen the inequality between the poor and the rich, showing an understanding of free trade agreements that many in the United States lacked. It said it had resorted to violence because peaceful means of protest had failed. The Mexican government, alarmed and surprised, sent several thousand members of the military and police to Chiapas to crush the uprising. The military handed out food to the impoverished peasants. It also detained scores of men. Many were tortured. Some were killed. There were 12 days of heavy fighting in which about 200 people died. By February the Zapatistas, who had hoped to ignite a nationwide revolution and who were reeling under the military assault, agreed to negotiate. While I’m not the Zapatista’s biggest fan (there are huge problems with concensus governance when it comes to personal rights), their critique of consumerism and globalism (which means screwing most of the world for the benefit of those who already had more than enough) has been sorely overlooked. The focus had to remain on dismantling the system of global capitalism itself. The shift from violence to nonviolence, one also adopted half a world away by the African National Congress (ANC), is what has given the Zapatistas their resiliency and strength…. This transformation by the EZLN, chronicled in some astute reporting by the Mexican novelist Alejandro Reyes, is one that is crucial to remember as we search for mechanisms to sever ourselves from the corporate state and build self-governing communities. The goal is not to destroy but to transform. And this is why violence is counterproductive. We too must work to create a radical shift in consciousness. And this will take time, drawing larger and larger numbers of people into acts of civil disobedience. We too must work to make citizens aware of the mechanisms of power. An adherence to nonviolence will not save us from the violence of the state and the state’s hired goons and vigilantes. But nonviolence makes conversion, even among our oppressors, possible. And it is conversion that is our goal. Hedges misses the point that Marcos was the wrong person to deliver the message, but does catch that the message itself is what we need. Mr. Grabman, I just love your column, I read it constantly, and you are almost always spot-on. But referring to Subcomandante Marcos as a “Stalinist”? Oh puh-leeeeez! Stalinism explicitly supports state terror as a means of re-educating the “duped by materialism” proletariat and purging enemies, it promotes the party over the people, because the party is just so much less duped, it looks to rapid industrialization at all costs, it dictates that other countries and societies adhere to the Soviet model, and it espouses active warfare to convert others. Anarcho-syndicalism, Subcomandante Marcos’s credo, does none of the above. I agree that its collectivization of policy can adversely affect minorities and minority views. Hell, I wouldn’t mind a cocktail in Agua Azul, but I can’t get one. But in fact, the great critique of anarcho-syndicalism is that it fails where Stalinism succeeds: videlicet, in the police and defense functions. They are considered adjacent in the mainstream view of the Left-Right spectrum, but that spectrum is pretty much a capitalist canard, or at least a 75-years-obsolete canard, that doesn’t speak to the way things work outside of Wall St. and the op-ed pages of American newspapers. Marcos is no Stalinist, and despite your other legitimate concerns about him as a spokesperson for the EZLN and the dispossessed of Chiapas and Tabasco and Oaxaca, it’s just silly to categorize him as so. Codswallop, Flapdoodle, and Humbuggery, are the three sins I accuse you of, sir!